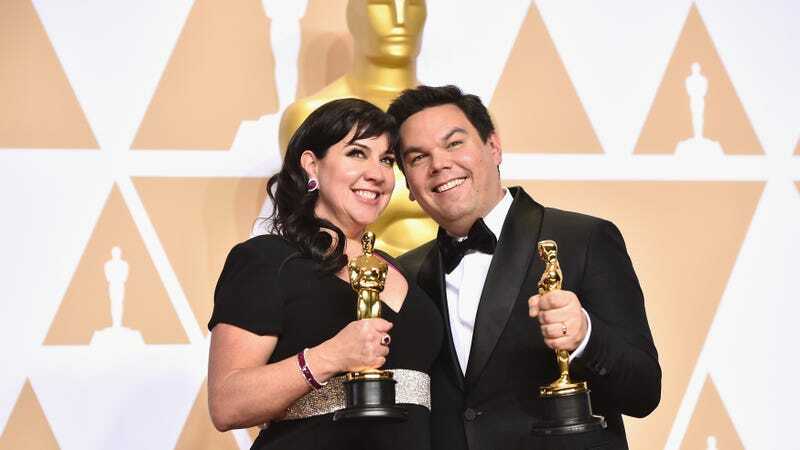 After husband-and-wife team Kristen Anderson-Lopez and Robert Lopez picked up their best original song Oscars for Coco’s “Remember Me,” he is now a freaking double EGOT. Congrats also to whomever will build the beautiful custom cabinets to hold this family’s absurd collection of awards! There are currently 12 individuals who have won at least one Emmy, Grammy, Oscar, and Tony (a list that includes Mel Brooks, Rita Moreno, and Whoopi Goldberg). Lopez, a composer who co-created The Book of Mormon and Avenue Q, has won at least two of each. Lopez won his first Oscar, also with his wife, for the song “Let It Go” from Frozen and two Daytime Emmy awards for his work on the animated children’s series Wonder Pets. His three Grammys are for Best Musical Theater Album (Book of Mormon), Best Compilation Soundtrack for Visual Media (Frozen) and Best Song Written for Visual Media (“Let It Go”). He has won every Tony he’s been nominated for: Best Original Score for Avenue Q, and Best Book and Best Original Score for Book of Mormon. Best part: Lopez is only 43. Dude’s gonna triple EGOT.